I once had a vision in which I was shown a scene during the time of the early dinosaurs. The little dinosaurs were walking through the ruins of what was once a building. It was to show me that at that time a civilization had already existed and gone by. This also implies that the beings who had made those buildings were not humans, because Homo Sapiens arrived many millions of years after the extinction of the dinosaurs. There is still plenty of evidence left on this planet that long before humans arose other intelligent beings had visited this planet, had built colonies and civilizations, and disappeared, probably from the moment Earth was inhabitable. We really have to put that old concept aside that humans were or are the only intelligent species on this planet or in the universe. Humans are recent newcomers on this planet. There were different cosmic races living on this planet in different time periods. For those who are familiar with ancient civilizations (more than 12,000 years ago) it has become obvious that the Earth was populated with human, hominid, humanoid and visiting extraterrestrial races. Especially the ET races brought with them sophisticated technology, and some of them also mined the earth for rare metals, minerals and crystals. Although the earth has undergone dramatic and surface changing catastrophes, there is still plenty of evidence of their existence and their level of technology, mostly in the cyclopic stone buildings left behind. What has also survived the many millennia are some rare metals alloys that were rust or corrosion resistant. Here you can find some examples of what people have found. Aluminum is the third most abundant of all elements (after oxygen and silicon). The crust of the Earth contains about 8% of it. However there no aluminum ores. It is always combined in many different minerals. Although aluminum is a common and widespread element, not all aluminum minerals are economically viable sources of the metal. Almost all metallic aluminum is produced from the ore bauxite. On top of that the extraction of aluminum from bauxite requires electricity. First Bauxite is converted to alumina (aluminum oxide) by heating and dissolving it with sodium hydroxide. This then gets melted at high temperature (950 and 980 °C (1,740 and 1,800 °F)) and mixed with calcium fluoride and electrolyzed to produce metallic aluminum. The liquid aluminum metal sinks to the bottom of the solution and is tapped off, and usually cast into large blocks called aluminum billets for further processing. Aluminum electrolysis with the this Hall-Héroult process consumes a lot of energy. In recent history aluminum was discovered in 1825 by a chemical reaction. In the mid-1880s, aluminum metal was exceedingly difficult to produce, which made pure aluminum more valuable than gold. In the late 1800 the Hall-Héroult electrolytic process was developed that facilitated large-scale production of metallic aluminum. Aluminum is a very useful product, because it is light weight, resistant to corrosion, and is strong and hard with the addition of other elements to create alloys. if there were indeed advanced intelligent beings on this planet long time ago, then they certainly were interested in mining and casting aluminum pieces for their own technological requirements. That would explain that once in a while an aluminum remnant is found by modern day humans. As it is always the case, when anomalous objects are discovered they are usually whisked away by certain interested parties who prefer that knowledge and artifacts of these ancient civilizations remain behind closed doors. So, what is known and available to see by the general public is only the tip of the iceberg. Not much is known about this object. It was found inside a 300 million year piece of coal, in Russia. 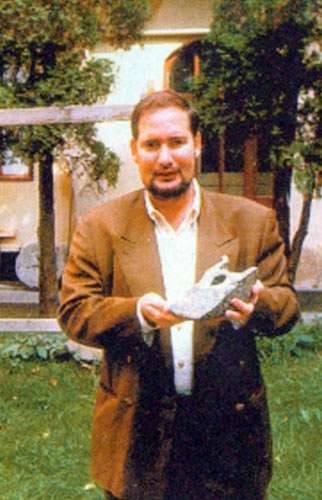 It is now in the possession of ufologist Valery Dvochynomo (Валерию Двужильному) recently became the owner of an interesting - and, as he believes - sensational - finding. In 2015, Dmitrya, resident of the city of Vladivostok (in the south-eastern province of Primorsky Krai (or Primorye), Russia), bought 3 tons of coal from Khakassia, in the south of Central Siberia. In one of the pieces of coal he found a strange rod-like piece sticking out, made of a whitish material. Because he was not able to determine what is was, he brought the find to Valery Dvozelnomo, a researcher of anomalous phenomena, living in the town of Dalnegorsk. After examining the find, Valery first thought that the coal contained a piece of petrified wood or an ore mineral. He then removed a piece from the core of the object, which was a little more than 7 centimeters in length, and covered with black coal that had become attached to it. After dissolving the coal with chemical agents it showed a metal silver color. Most interesting was the fact that after cleaning it showed a couple of teeth with spacing between them, looking like a metal gear, and thus it must have been artificialy created by technological means. The coal in which the metal object was embedded came from the Chernogorodskiy mines in the Khakasia region. 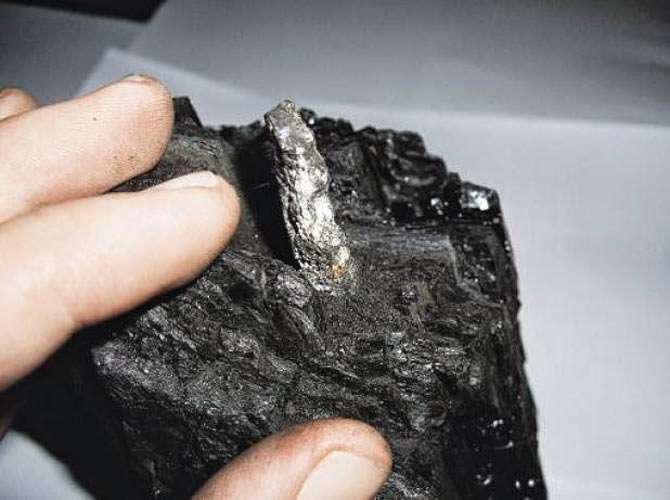 These coal deposits date from 300 million years agg, Russian experts inferred that the metal part found in this piece of coal must be of the same, Russian experts inferred that the metal part found in this piece of coal must be of the same age. Experts inferred that the metal part found in this piece of coal must be of the same age. In order to find what the metal piece was made of, Valery conducted an X-ray analysis. This showed that it is consists to very pure aluminum with magnesium content of 2 to 4 per cent. In our modern times there is only one aluminum-magnesium alloy, called Magnalium, which has 5% magnesium. This alloy allows for a greater strength, greater corrosion resistance, and lower density than pure aluminium. This alloy are more workable and easier to weld than pure aluminium. It is used in aircraft and automobile parts. This an ancient aluminum piece found in Romania, heavily oxidized, 10 meters (33 feet) deep, lying next to bones of a prehistoric animal. 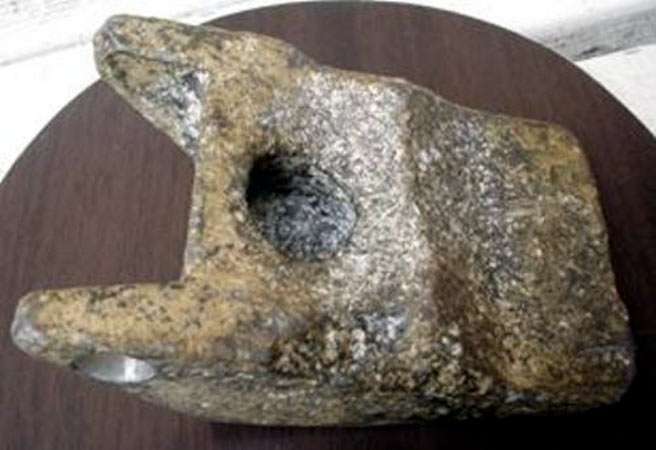 This is an interesting story because it clearly shows that the object is not only very ancient, but is the product of an advanced technology. Because of its shape it has been called a Wedge, an Axe, a Heel. Personally I think that the suggestion made by a scientist that the object most closely resembles a part of a landing gear of a flying object is the most plausible to date. if the object really dates from a period in the past when humans were very primitive or not even around, then it can only have come from other intelligent beings, in other words, extraterrestrials who were exploring this planet, or may even have settled here for a time. The aluminum piece was found in the Romanian town of Aiud, in 1974 at 10 meters (33 feet) deep, together with mammoth bones. 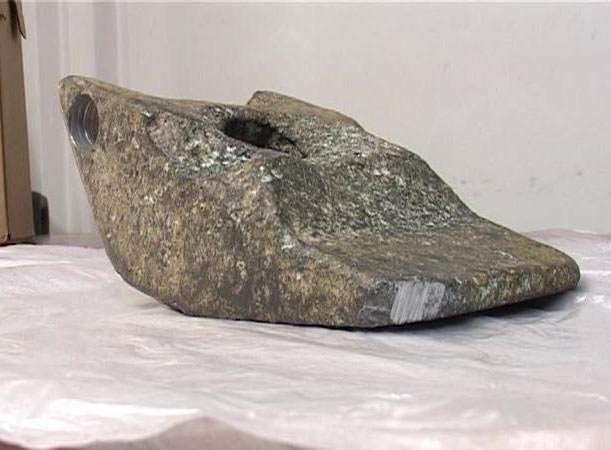 Originally it was thought that the object was a stone axe and it was sent to the Museum of Transylvanian History in Cluj-Napoca. Once the items were cleaned it turned out that the supposed axe was something totally different. It was made from aluminum and clearly the product of a technological process. 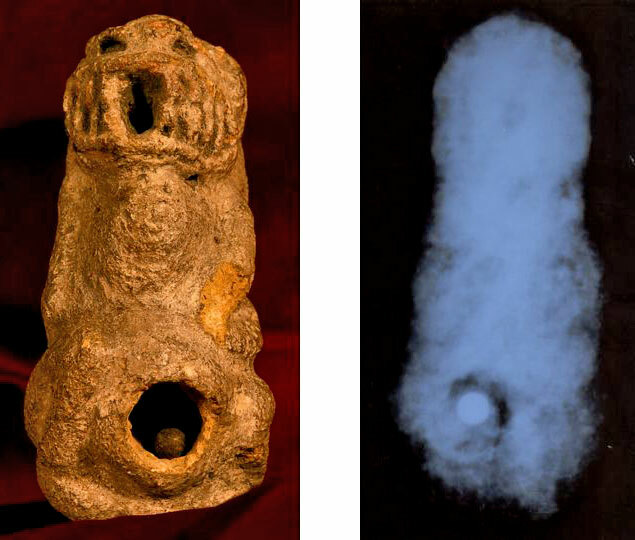 Romanian investigator, Florin Gheorghita, wrote about the strange artifact in his 1983 book "Enigmas in the Galaxy". Then, it ended up in a museum storage room until 1995 when two editors of a Romanian UFO magazine called RUFOR found out about its existence and requested another set of tests. It is presently in the possession of National Museum of Transylvanian History (Muzeul Naţional de Istorie a Transilvaniei) in the city of Cluj-Napoca, Romania. In 1995 the founders of the Romanian UFO magazine RUFOR, decided to do a new investigation into the mysterious aluminum object. Their findings were published in their RUFOR Magazine, Nr.2 (15), 1995. The following is a Google Translation with some necessary corrections. 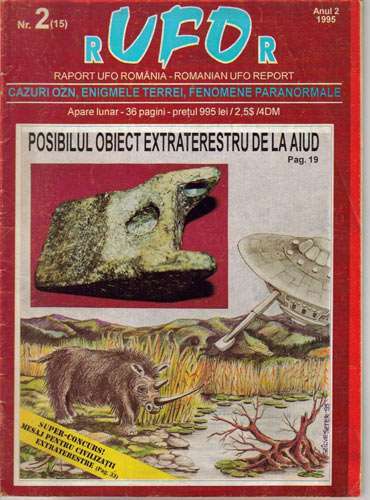 For the first time we could find out about the strange object discovered in the summer of 1973 in Aiud in the 1983 book by Florin Gheorghita "Enigmas in the Galaxy", printed by "Junimea" Iasi. In the 6th chapter, "Visits on the blue planet", page 152, the author describes the history of the sensational discovery in Aiud. According to the author, in 1973, near Aiud, during excavations in a sand quarry, in a 10m deep layer, "3 objects encased in a shell of pressed sand" were found(quote page 152). An expert called to the scene "identified one of the respective bodies as a fossilized bone"(quote page 153). The expert gave the finds to Cluj-Napoca. Here ends the first part of the bizarre discovery's odyssey. Experts cleared the sediment layer from the biggest object. It was no small surprise when they discovered that it was a weird shaped, metallic object with obvious signs of being manufactured. According to the Iesean author, the other 2 relics were part of a "skeleton of a mastodon"(quote pagge153). Intrigued by the item's aspect and the fact that an artificial metallic object was found in such an old geological layer,153). Intrigued by the item's aspect and the fact that an artificial metallic object was found in such an old geological layer, Clujean experts sent fragments for analysis to the research center of ICPMMN Magurele. Another surprise: An ancient aluminum object! The performed analysis baffled even the experts of Magurele. 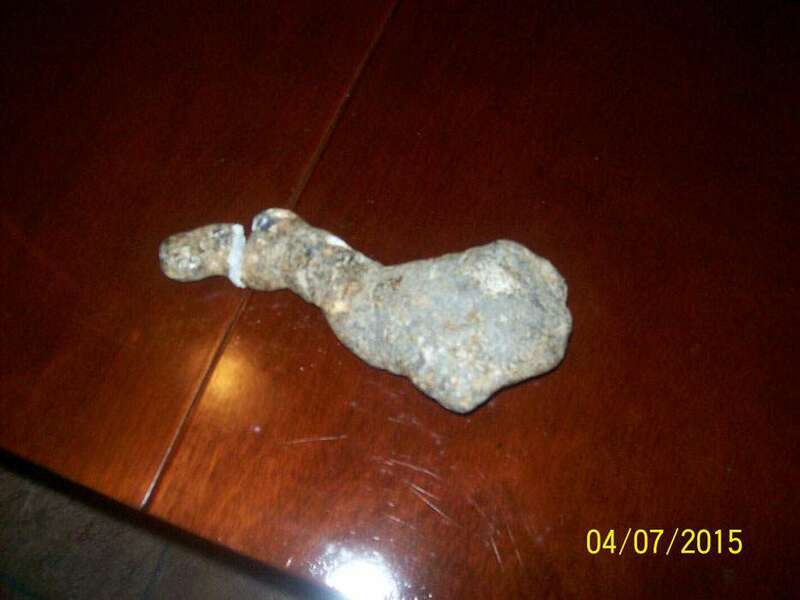 The object was composed of an alloy of aluminum with additives of other rare metals. Let's look at the conclusions of these experts, reproduced in the book of the Iesean engineer: "(...) it was a complex alloy composed from 12 different elements, in different percentages. The main component - the big surprise - was aluminum (89%)! The rest of the component elements that were found (in the order of the size of the determined percentages): copper (6.2%), silicon (2.84%) zinc (1.81%), lead (0.41%), tin (0.33%), zirconium (0.2%), cadmium (0.11%), nickel (0.0024%), cobalt (0.0023%), bismuth (0.0003%), silver (0.0002%), gallium (traces)." (quote page 154). The same experts were surprised by the layer of aluminum oxide on the surface of the object and also by the state of "aging" of the object itself. It is known that aluminum was discovered in a laboratory in 1825 by H. Cr. Oersted. Its industrial production was only possible after its discovery and by means of electrolysis, at the end of the 19th century, in 1883. The biggest producer of aluminum is ALCOA in the USA. Usually, aluminum creates an very thin and hard oxidized layer on its surface, and this protects the aluminum from oxidizing further. The existence of an object made from aluminum in a profound geological layer, and the oxide layer of at least 1mm, baffled the metallurgic experts. 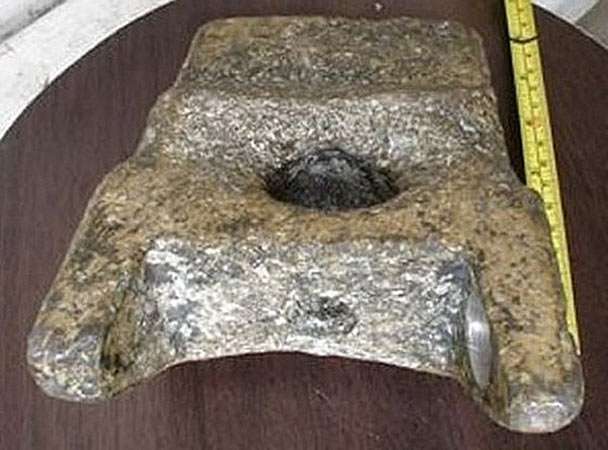 Here we have a manufactured aluminum object, apparently a part of a landing gear that was centuries or millennia old, before the discovery of aluminum! The other components are less contradictory: cadmium was discovered in 1817, nickel in 1751, bismuth in 1753, cobalt in 1735. The sensational discovery in Aiud was known by many authors, but none of them had ever tried to find its existence. The answer to a letter sent to Florin Gheorghita in 1987 was disarming: "sadly, the location of the object from Aiud is unknown.". I thought that it would be similar to so many other strange objects found all over the world which were lost forever. "Transylvanian object", the name used by many authors, remained just a myth instead of something real and tangible. When the magazine RUFOR was launched we decided to look again for the object. We decided to "use the wire", in our attempt to find it. The first thing we did was to contact the Museum in Aiud. We mailed this institution, because it did not have a phone, in August 1994. Not even to this date have we received an answer! We started to think that our investigation reached a dead end. In our attempt to get out from this impasse, we decided to contact the History Museum of Transylvania in Cluj-Napoca. Our first contact with this prestigious institution was made at the end of January 95. Even if we expected a skeptic answer, if not ironic, we were told that THE OBJECT FROM AIUD EXISTS! and that it is present in the heritage of the Museum in Cluj. More than that, we were recommended to keep in touch with the person that was responsible for the object, which proved to be none else than the director of the Museum in Cluj! Having this information at hand, more than promising, we contacted Mr. Lazarovici by phone. Very amiable, he has confirmed that the item exists, and, if we want, we can go to Cluj to study and photograph it. Considering his busy schedule, we agreed on more telephonic discussions and that our "trip" to Cluj to be on Friday, February 17 1995. In the morning of Feb 17, accompanied by our colleague from Cluj, Mr. Adrian Patrut, we went to the office of the director of the HM of Transylvania. Mr. Georghe Lazarovici was expecting us. Even before we arrived, he readied the strange object for us. So, when we arrived, we only had to wait a couple of minutes before the item was in our hands! The object has a more than interesting aspect: it is like a tripod or like a foot of a landing gear. The base of the "foot" wasn't level, it has a deviation of 1/3 on the frontal side of 15 degrees. In the rear, there were two "arms" in the shape of a triangle placed at 45 degrees from the surface of the object. At the rear end, there was a small orifice, and horizontal a bigger orifice (see pictures). 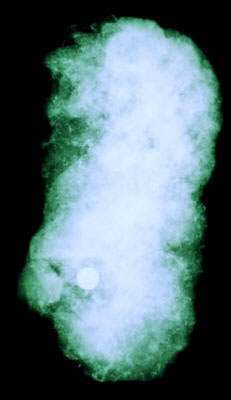 The entire object was covered in a layer of thick oxide, of a white-yellowish color with a green tint, and on the upper part one could observe, visibly mechanically erosion, either by hitting, either by mechanical corrosion, such as friction with a harder object (by collision?). As we recalled, in the book of Mr. Florin Gheorghita the idea was put forward that the bones found near the object in the same geological layer, would be mastodon bones. Director Gheorghe Lazarovici made some very important statements about this subject. According to his declarations, the bones found were from a species of hairy rhino. According to our data, the hairy rhino lived in our geographic area during the Pleistocene era (10,000-80,000 years ago). This period was contemporary with the habitat of the Neanderthals. This interglacial period can be characterized with a pretty harsh climate, similar to the taiga and tundra. This is extremely important. As a first conclusion, we can say just that the aluminum object comes from a geologica llayer of a periodin which human ancestors not only knew aluminum, but who also lived in the first period of the Paleolithic! Mr. Marian Pasla, retired engineer, closely examined the "object from Aiud". 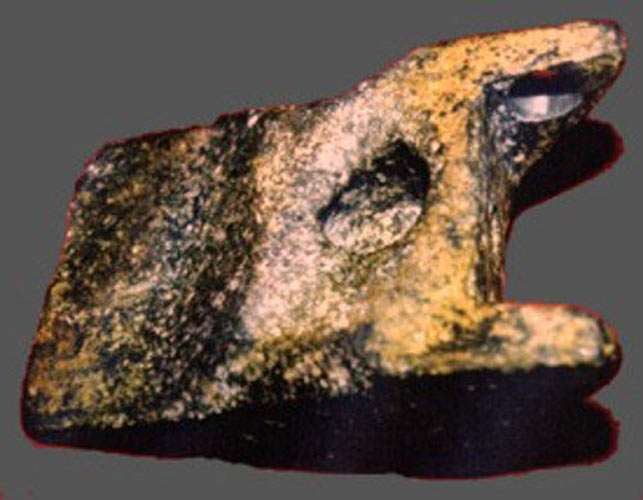 He confirmed that a piece extracted from this object was examined by a laboratory in Lausanne (Switzerland). Swiss experts confirmed the composition of the object, which was the same as the one from Magurele. Also, they stated that the alloy did not fit in one of the "standard" alloys we use today. The alloy was defined as "weak", not a durable aluminum, and that it has "designer angles", which shows the artificial characteristic of the object. Based on the layer of oxide and of the "aged" aluminum, prof. Stoicovici reached the conclusion that the object could have an age of at least 300-400 years. But, according to another specialist, cited by Florin. Gheorghita, the age of this object could even be of thousands of years. Even if the age of the object is the lesser one, in no way does this item fit into the stand history of discovery, processing and industrialization of aluminum. Taking into consideration the chemo-metallographic analysis, we can conclude that the item discovered in Aiud, in 1973, has an age that can be fit somewhere between 300 and 80,000 years. In either case, this affirmation comes in contradiction with what it is know about the usage of aluminum in the technological history of humans. The geological stratigraphy shows that the object is probably older, and of the same period than that of the hairy rhino, of which the fossils were found in the same petrified layers. equally important is that the object was found at a considerable depth (~10m). Another conclusion: the object is an artifact created by "engineering" methods. The two existent orifices, as well as the existence of the "rear arm" determines us to believe that this item was part of a landing gear of large dimensions, being a component of it. Of course, the temptation of expressing some other hypothesis is great. Yet, we can not not overlook the fact that the shape and characteristic of this object are strikingly similar with the landing gear of a drone or spacial robot. As Florin Gheorghita assumes in his quoted work, the object could have collided with a wild animal (the hairy rhino), and has partially deformed, losing a part of its landing gear, resulting in the death of the animal. Or: if the hypothetical item was completely destroyed, the rest of the parts could still be buried somewhere deep in the ground, near Aiud. And if it is indeed a part of a flying object which overflew the tundra of the Pleistocene, then who has built it and where does it come from? A possible answer is hard to give. But a possible confirmation of this question is prone to cause shivers. A lot was written about metallic objects (iron or steel), found in coal mines, in million year old geological layers. But to this date, nothing but descriptions remain, the objects always disappear. There are rumors of aluminum chest plates, discovered in the tombs of ancient Chinese emperors; but with the relevant literature, none of these were ever seen by a certified researcher. Doru Davidovici, in his book, "Galactic worlds", speaks of a goddess made of Orichalcum, discovered in a coal mine, somewhere in Jiu Valley, but which disappeared in even more mysterious conditions. In 2007, George Cohal, and Ion Nutu, members of the organization ASFAN (Asociatia pentru Studiul Fenomenelor Aerospatiale Neidentificate, or Association for the Study of Unidentified Aerospace Phenomena, in Romania) together with Cristian Pompei, of the magazine “Lumea Misterelor” (The World of Mysteries) went to the National History Museum of Transylvania in Cluj-Napoca in May 2007 to conduct another investigation. The results of new analysis of the aluminum object provided some interesting results: the composition of the metals varied a lot, and thus is not homogeneous. This would indicate that the object is of inferior quality, what would be contradictory to the assumption that the piece was part of a highly technical flying machine. Although it is clearly artificial it might have made on Earth as part of another technical device that did not require high quality parts. Unless it was part of a bad batch and thrown away. It is still anybody's guess at this point. 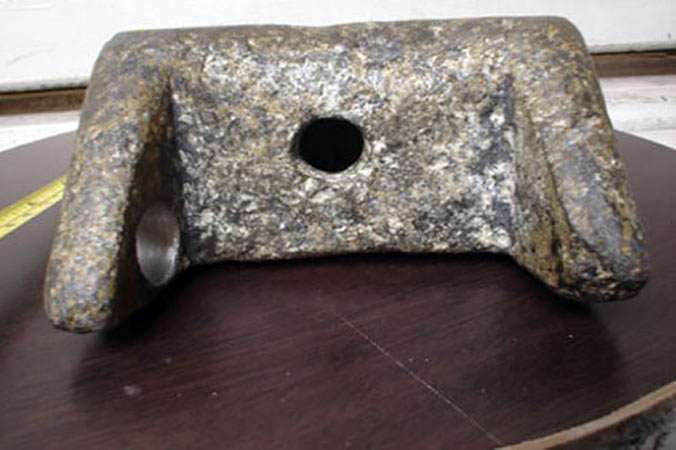 In 1973, in Romania, in the heart of Transylvania, near the town Aiud, workers extracting sand from a quarry not far from the river Mures, found, at the bottom of the excavated bank, a strange aluminum object whose properties have not been explained. There were three hard bodies, „packaged” like in a shell of hardened sand. They had stood a long, long time beneath that – almost 10 meters thick – layer, deposited over time overhead. A specialist was called urgently to the sand career to identify the bodies. In two of them he found fossil bones; and in the third, something that seemed, by the shape and weight to be a stone axe that would be served primitive man in killing the animal whose bones were found together. For a proper study, the three items were sent to the History Museum at the city of Cluj-Napoca. Carefully removing the surrounding petrified sand layers, the specialists found a piece of a leg bone and a piece of tooth, both of a young mastodon, and a totally unknown object, which was not in any case an ax and was not even from stone: it was metal! Detailed analysis has had to offer but more interesting surprises. 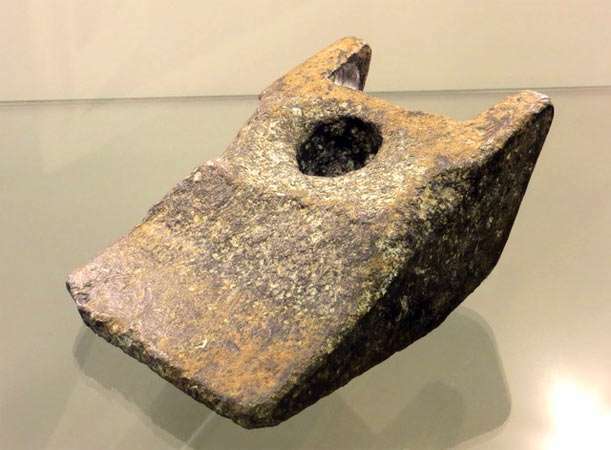 The object, about 20 centimeters long, 12.5 centimeters wide and about 7 centimeters thick, had two cylindrical holes, of different diameters, so that the narrow hole penetrates the object toward the base of the larger hole in a perpendicular way. Moreover, the larger hole had in its lower part a chamber as for assembling a rounded axle head in it. On its lower surface and in sides the object showed traces of repeated blows, some of which were strong. All details suggested that it was once part of a bigger device and was lost for one reason or another, in the river bed. Mastodons, related to elephants, lived from 34 million years ago and disappeared 11,000 years ago. Some estimates said that the age of the bones found was about one million years. Repeated metallographic analyzes made with the strange object raised further questions. 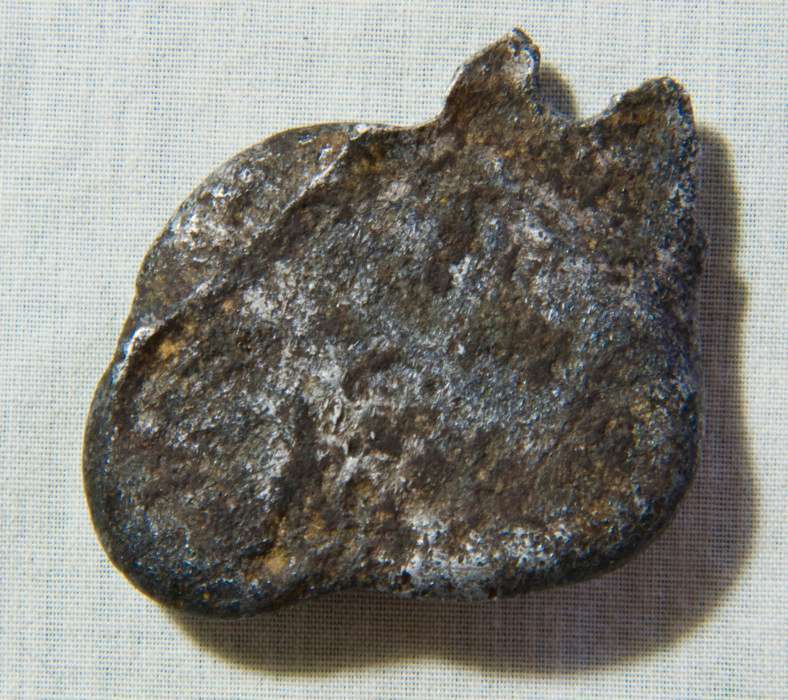 The bulletin issued by ICPMMN Research Center (in Magurele, near Bucharest) shows that the metal piece was actually a complex alloy composed of 12 different elements, among which the main constituent was the aluminum, in a proportion of about 80%. A very unusual feature was the existence of an anomalous thick layer of aluminum oxide on the entire surface of the object. It is known that this metal oxidizes very hardly in depth, usually the first thin oxide surface layer limits the penetration of oxidation phenomena in the metallic body. The most plausible explanation seems to be, from this point of view, that the object is very old... But the aluminum was discovered in the laboratory in 1825 by Oersted, and the industrial production was started only about 1883... in a century it was virtually impossible to produce an oxide layer so thick. Moreover, a specialist from Bucharest who attended repeatedly the metallographic analysis wrote: "it’s puzzling but the aluminum has an aging structure, and the alloyed elements regained partly their structures too”. Of qualified people who saw that piece (archaeologists, university professors, engineers), no one was able to identify the object or to find a resemblance to a human product. The exception was a specialist in aviation engineering who suggested that the object might be a landing foot of a small aircraft. Was someone in prehistoric times, flying through those places in Transylvania, landing on the banks of a river, and losing one of its supporting pieces? The information above was taken from the book of Florin Gheorghita “Enigme in Galaxie” (Enigmas in the Galaxy). 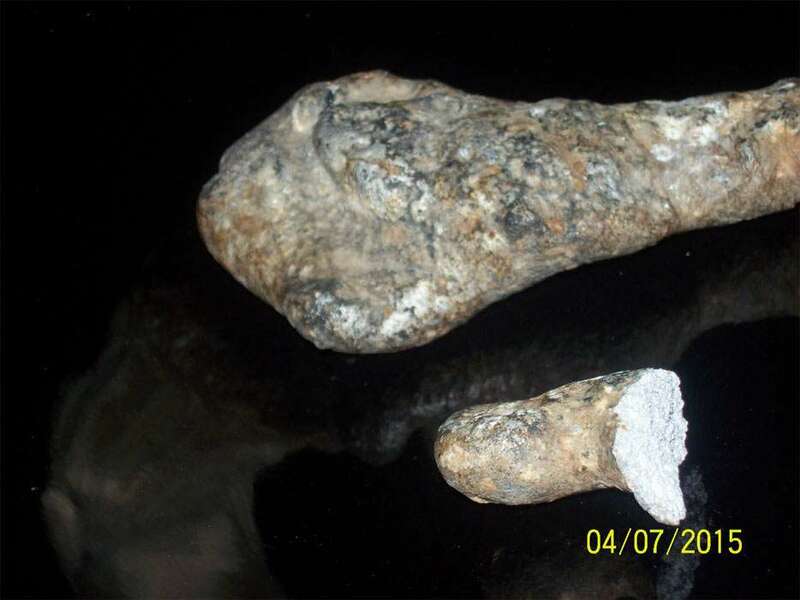 A team, which included members ASFAN George Cohal, and Ion Nutu, as well as Cristian Pompei, of the publication “Lumea Misterelor” (The World of Mysteries) found the object in the deposits of the National History Museum of Transylvania in Cluj-Napoca in May 2007. Museum director: Ms. Viorica Crisan, along with Ms. Zoia Maxim, offered all the necessary clarifications, including copies of newspapers and some reviews on the Internet. Unfortunately, multiple causes, among them because the museum was under renovation, they could not submit any original documents or reports of analysis performed in the '70s. Previously, the object was the star of an exhibition in the museum but it was withdrawn after a while by the administration of that time of the museum. The same management refused the request to show the object in an “ancient aliens” exhibition in Germany, organized by Erich von Daniken. It's been said on this occasion that some experts estimated, by evaluating the aluminum oxide layer over a millimeter thick, that the object discovered near Aiud could have a fantastic age of 250 000 years! 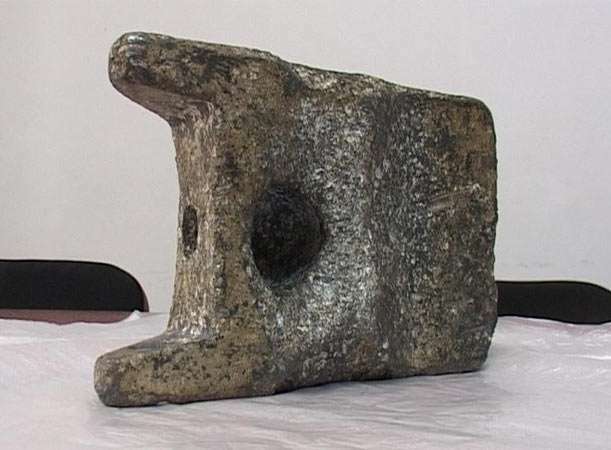 At the request of the Cohal-Nutu-Pompei research team, the „aluminum heel” was brought ​​by Ms. Zoia Maxim to Bucharest, for new analyses at Magurele platform. Here two sets of analyzes were accomplished, by two different methods. At the National Institute of Research and Development for Physics and Nuclear Engineering, Department Archaeometallurgy, the results were the following: Aluminium - 80.5%, tin - 6.5%, copper - 6% Silicon - 4% Zinc - 2%, Lead - 0.5% Antimony - 0.5%, in addition were highlighted traces of silver, nickel, manganese and iron. The second, non-destructive, analysis of a fragment of the Aiud object, accomplished in the Laboratory of the Faculty of Physical Metallography, revealed 97.6% aluminum, 2.4% tin and less than 1% other elements. Both analyses amazed the experts, because they were convinced that it is a metallurgical impossibility! Aluminum is not alloying with tin! The first analysis was made by the Centre for Research and Design for radioactive metals - Magurele – Bucharest. The Analysis Report no.334 of the sample symbol A-1975-CNST-Bucharest shows: Al - 74.17%, Cu - 4.62%, Zn - 1.81% Pb - 0.11% Sn - 0.33% Ni - 0, 0024% Bi - 0.0003% Ag - 0.0002%, Co - 0.0023% Cd - 0.11% Zr - 0.20%. Ga - trace and Si - present. Some other elements were also present. The report is signed by Section chief, Dr.eng. Ion Niederkorn, eng. St. Neciu, and senior researcher M. Gradin. The second analysis, made by the same Centre, has the Analysis Report no.380, the sample symbol NK-2, brought by Dr.eng. Ion Niederkorn, shows: Al - 92.74%, Si - 2.84%, Cu - 6.2%, Zn - 0.95% Pb - 0.41% Sn - 0.33% Ni - 0.002% Bi - 0.0003, Ag - 0.0002%, Co - 0,002% Cd - 0.055, Zr - 0.20%. Engineers at “Alro” of Slatina, one of the biggest aluminium companies in Romania and in Europe, examining these analysis reports, made in the '70s, could not identify similar aluminum alloys produced in the world. As one can easily see, there are considerable differences between the reports. Could it be because of the aging of the metal alloy? What if the flattening of the vertical cylindrical hole in the back of the object was due to a battle between the mastodon (one million years old) and a "robot”, plucking the landing sole and provoking death of mastodon? Can anyone say how it behaves an alloy over such a period of time? We have indications that other such objects have been found in our country, often by chance, but because their presence in that place could not be explained, they were ignored, discarded or destroyed. Who was their manufacturer? Was it an earthly civilization now disappeared? Or, why not, some spatial or temporal travelers? The Nanjing Belt is a collection of metal pieces that once were part of a belt, found in a Chinese tomb of the 3rd century. Some of the pieces were made of aluminum. For as far as we know the Chinese at that time were not able to make or forge aluminum. Therefore it is possible that the aluminum pieces actually date from a far earlier date, when a highly technological society was able to mine and process aluminum. Once lost, they were found during the 3th century. To the people of that era the aluminum pieces composed of an unknown and mysterious metal. Therefore it is likely that they made their way up the social ladder and were ultimately given to their ruler, who incorporated them into his own belt, together with other, silver pieces. Some people suggest that the Chinese might have been able to extract aluminum from the soil or rocks. If this was the case we should have found more items made of aluminum from that period. There are only two references to the Nanjin Belt. One by Joseph Needham in his Science and Civilization in China, and one by Arthur C. Clark who seem to have come across more Chinese publications. First the story mentioned in Arthur C. Clarke's book Chronicles Of The Strange And Mysterious, 1987. The most puzzling archaeological mystery of ancient China came to light in the true tradition of buried treasure when a workman's spade broke through the roof of a long-forgotten tomb. It was 1 December 1952. The ingyi Middle School of Yixing City in the Jiang-su Province of China was building a sports field. The first task was to level the ground, for the school authorities had chosen a patch of land dominated by an oblong hillock. Another feature of the site, four curiously shaped mounds, complicated the work. That day, a labourer's shout brought everything to a halt. His spade had penetrated a thin layer of earth and rubble and a hole had appeared, releasing a rush of musty air. Peering into the darkness, the work gang could dimly make out a chamber stacked with dusty objects. They called the police, who climbed down through the opening and soon announced that the workers had made a major archaeological find. The place was obviously a tomb. After taking into safekeeping a motley collection of grave goods, including five pieces of porcelain, eleven of pottery, some scraps of gold, two pottery stands and 'four gold articles', the police sealed the chamber and the Huadong Historical Relics Working Team was summoned to conduct a full-scale excavation. The dig revealed that there were in fact two tombs, both built in an unusual style. Each had chambers with an arched roof constructed in wedge-shaped bricks, topped with a square slab. More bricks, laid in a herringbone pattern, covered the floor. The roof was adorned with carvings: circles, tigers or the faces of animals. Conveniently, the "Number 1 tomb' contained an inscription which enabled the archaeologists to date their find precisely. On one side it read: '20th September of the seventh year of Yuankang the late general Zhou ...'; on the other, the tomb builders had left their official titles and signatures: 'Yicao Zhu Xuan, jianggongli Yang Chun, workman Young Pu made.' This, then, was the burial-place of a nobleman called Zhou Chu. Zhou could be traced in the historical records. A renowned military man and scholar, he had lived during the Jin Dynasty (A.D. 265-420), and had died fighting the Tibetans in 297. There could be no doubt whatsoever about the dates, and this made one discovery all the more astonishing. Encircling what had once been the waist of a rotted skeleton found in the "Number 1 tomb' were about twenty pieces of metal, obviously the remains of a belt. 'The factor worth noting,' wrote archaeologist Luo Zong-chen with what proved to be breathtaking understatement, 'is the chemical composition of these ornaments.' 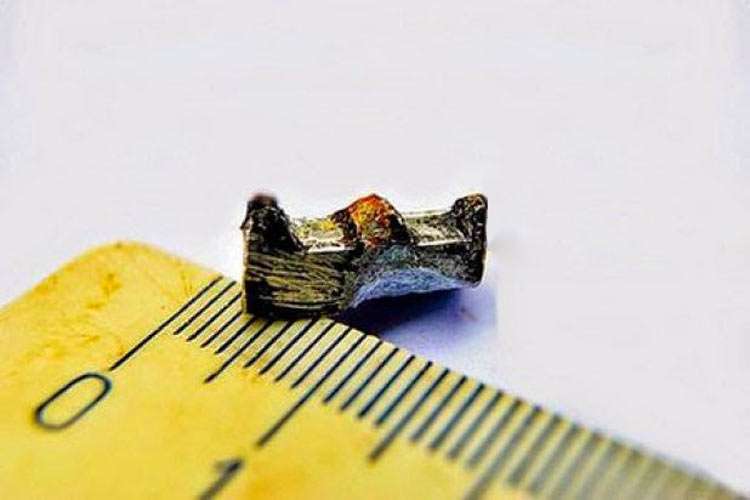 For analysis of one fragment by the Chemistry Department of nearby Nanjing University revealed that it was composed almost entirely of aluminium. Now, although aluminium is widely used in modem life, it was not isolated in the West until the early years of the nineteenth century, and a generation later was still so rare that it was a showpiece of the 1855 Paris Exposition. The production of aluminium requires something thought to have been quite unknown in ancient China: electricity. 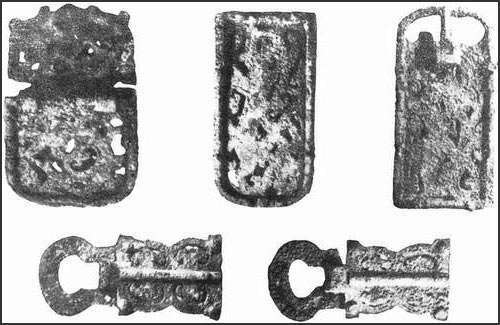 The discovery of the belt therefore raised a question which fascinated archaeologists, metallurgists and chemists both inside China and far beyond its boundaries: did the Chinese beat European scientists to the isolation of aluminium by a cool 1,500 years? While it would be going too far to say that archaeologists have become used to pondering such problems - their working lives are usually devoted to the painstaking accumulation of more prosaic evidence of the daily lives of ancient peoples - a few objects like the Nanjing belt have presented them with an irresistible and potentially unsettling challenge. Did the scientists, artists and builders of the past know secrets that their successors have taken centuries to rediscover? Should our ideas about the level of technology achieved by the ancients be drastically revised? How then did the experts set about finding the answer to the puzzle of the Nanjing belt? As so often happens, they first fell to arguing. Their discussion of the archaeological evidence did not detain them for long. They argued that standards of excavation are high in China - the painstaking manner in which the first emperor's terracotta army has been uncovered and preserved at Xian is one of the most recent examples - and concluded that 'there can be little doubt that the aluminium artifacts were found in the tomb'. They also gave short shrift to a suggestion that the belt had somehow been 'planted by grave-robbers: It is difficult to see why they should have left the silver objects in place and have carefully inserted pieces of aluminium for the confusion of future excavators. A tomb-robber is scarcely likely to have had scraps of kitchen utensils about his person and to have discarded them accidentally. It would also need a miraculous breeze to replace the dust. Butler and his colleagues devoted most of their paper to the central question: Did the Chinese of the Jin Dynasty have the know-how to produce aluminium? While the modem method of isolation uses electricity, aluminium has been produced in furnaces, though these need to be extremely hot. The Chinese certainly had furnaces capable of producing high temperatures, perhaps as great as 1,500°C, but, the St Andrews team concluded, these would have been capable of making metal containing only very small amounts of aluminium. And there was no method available to Jin Dynasty metallurgists which would have enabled them to manufacture aluminium of the purity of the metal found in Zhou Chu's tomb. So what is the answer? How can it be that pieces of almost pure aluminium should turn up in an ancient tomb? With a touch of the theatrical, the Scottish researchers saved their theory for the last paragraph of their report: We are led to suggest, for want of something better, [they wrote] that the aluminium was introduced as an academic prank by a participant who was probably greatly embarrassed when he realized the consequences of his actions. Fortunately for scholars in the West, the Chinese themselves were the first to doubt the authenticity of the claims. It is perhaps a mark of our regard for the enduring genius of the Chinese people that the claims were taken seriously for so long. The St Andrews paper seemed to have settled the argument. Hoaxes, of course, are nothing new in archaeology, and the story of the Nanjing belt was duly dubbed 'the Chinese Piltdown' after the most celebrated hoax of modern times, in which a weird amalgam of a human cranium and an orang-utan's jawbone, unearthed in the south of England in 1912, was successfully passed off for some forty years as the skull of an important 'missing link' in the evolutionary chain. Yet in 1985 the Bulletin of the Chinese Academy of Geological Sciences reported a discovery which revived the possibility that aluminium had been available in China at the time of General Zhou's burial. Geologists from the Shenyang Institute of Geology announced that they had found grains of 'native aluminium' in Guizhou Province. "Native aluminium' is extremely rare, indeed only a handful of claims for its discovery have ever been made. According to the Chinese geologists, their specimens contained 'some copper and sulphur, also chromium and iron' and were harder than pure aluminium, but they were satisfied that they had been found 'in a situation where contamination by men was eliminated. The report brought this comment from Dr Anthony R. Butler of the St Andrews team: I think the evidence for the presence of native aluminium is good but the manner of its production is obscure. The grain size indicates that it could not possibly have been used to make the Nanjing belt. For native aluminium to have been used for that, an even rarer geological process, giving lumps of aluminium rather than grains, would be necessary. While this is a possibility, made more possible by the discovery of grains of native aluminium, it remains a remote hypothesis. However, a general rule is never to underestimate the Chinese. After all, they did invent the compass, printing and gunpowder. Here is the extract from Joseph Needham Science and Civilization in China Volume 5 (1974) page 192, that talks about the Belt of Nanjing. "Some metals, of course, such as platinum, palladium, and possibly cadmium, can be excluded from the medieval Chinese set of metals and minerals with a fair degree of certainty. But aluminium occupies a place by itself, and a somewhat controversial one, for during recent years it has been the centre of a kind of cause célèbre, by no means yet resolved. In 1956 a team of archaeologists from the Nanking Museum, headed by Lo Tsung-Chen, excavated at I-hsing in Chiang-su the tomb of a Chin dynasty worthy, Chou Chhu, who died in +297. Some twenty metal belt-ornaments were found embedded in dust and dirt near the waist of the body, and many of the fragments of these were submitted to chemical analysis. Though some were mainly of silver and copper, others were almost wholly of aluminium, with up to 10% of copper and 5% of manganese. Since aluminium is a very difficult metal to smelt and was not isolated until after 1827, this discovery aroused intense interest in the realm of metallurgical-chemical history. The large-scale production of aluminium from bauxite by electrolysis was achieved only in 1889, so the discovery of an alloy dating from the +3rd century yet having aluminium as its main constituent remains quite extraordinary. Further confirmatory analyses wree presented in 1959 by Yang Ken, who reported a laboratory experiment in which charcoal was used as the reducing agent, aluminium oxide powder and finely communited copper as the materials, with borax as the flux; on heating, a small amount of a low aluminium-copper alloy was produced. No metallurgical chemist is prepared to believe, however, that an 85% aluminium-copper alloy could ever be obtained by such methods, nor is there less scepticism about another proposed technique in which caustic alkali would release ionised metallic sodium or potassium to replace successive quantities of aluminium which would then immediately dissolve in the molten copper. Yang Ken's communication gave rise to a considerable retentissement in Western technical journals, and chemists began to range themselves on opposite sides, in China as well as in Europe. While Chang Tzu-Kao accepted the findings whole-heartedly, they were strongly criticised by Shen Shih-Ying, who himself, however, found high aluminium contents in some of the material, mixed with minor constituents which would not be expected in modern aluminium produced by electrolysis -- unless it had been re-melted in a not excessively clean workshop. What he threw doubt on was the exactness of the archaeological excavation, but this is just what is difficult to query for those who are of the high scientific standards achieved in such work under the auspices of Academia Sinica during the past two or three decades. The dig was defended in a rejoinder by Lo Tsung-Chen, but pending further developments some of the chemists are at loggerheads with the archaeologists on the matter. For us the lesson seems to be that for the present it would be unwise to rule out the possibility that some medieval Chinese alchemical alloys may have contained aluminium. After all, the spagyrical metallurgists were constantly mixing metals and minerals and heating them together, while temperatures sufficient to melt cast-iron had been available since the late Warring States period. The question also remains to be answered whether these aluminium-copper alloys, if genuine, were obtained intentionally or by accident due to the use of particular ores. The argument that the secret, if such it was, could hardly have been altogether lost in later periods, is rather a weak one, for as we shall have abundant opportunities of noting, the Chinese alchemists were disinclined to be talkative about their special triumphs, and in the secretive period of medieval science, processes could only too easily be lost with their authors. We shall see, therefore, whether any other ancient high-aluminium articles turn up, reserving judgment in the meantime. So much for the metals which the adepts of old could or could not have used." Steven Strong from Forgotten Origin mentions in his Presentation given by Steven and Evan Strong (at the UFO Research (NSW) Incorporated meeting held on the 16 April 2016 at Ryde Eastwood Leagues Club, NSW, Australia) that one of the aboriginal elders gave him a small metal piece he found at the Kariong site. Although not analyzed the very light weight of the metal suggests that it is made from aluminum. He showed it to metallurgists who could not identify the composition based on visual inspection alone. So it might be aluminum or an alloy of aluminum, or another light weight metal/alloy. Not much information, but worth mentioning. "One day a goldsmith in Rome was allowed to show the Emperor Tiberius a dinner plate of a new metal. The plate was very light, and almost as bright as silver. The goldsmith told the Emperor that he had made the metal from plain red clay. He also assured the Emperor that only he and the Gods knew how to produce this metal from clay. The Emperor became very interested, and as a financial expert he was also a little concerned. The Emperor felt immediately, however, that all his treasures of gold and silver would decline in value if people started to produce this bright metal of clay. Therefore, instead of giving the goldsmith the recognition he desired and a reward, he ordered him to be beheaded." Is it possible that this light, bright silvery metal was aluminum? The goldsmith claimed that he had produced it from red clay. Although nowadays we produce aluminum with a complicated process including electricity, it is possible to produce aluminum from clay, although in small quantities, which is not cost effective in modern terms. In 1754, German chemist Andreas Sigismund Marggraf synthesized the earth of alum by boiling clay in sulfuric acid and subsequently adding potash. The resulting alumina was later found to be aluminum oxide. Attempts to produce the aluminum metal date back to 1760. The first successful attempt, however, was completed in 1824 by Danish physicist and chemist Hans Christian Ørsted. He reacted anhydrous aluminum chloride with potassium amalgam, yielding a lump of metal looking similar to tin. He presented his results and demonstrated a sample of the new metal in 1825. Maybe, about 2000 years ago, an Italian goldsmith had already stumbled upon such a chemical extraction. 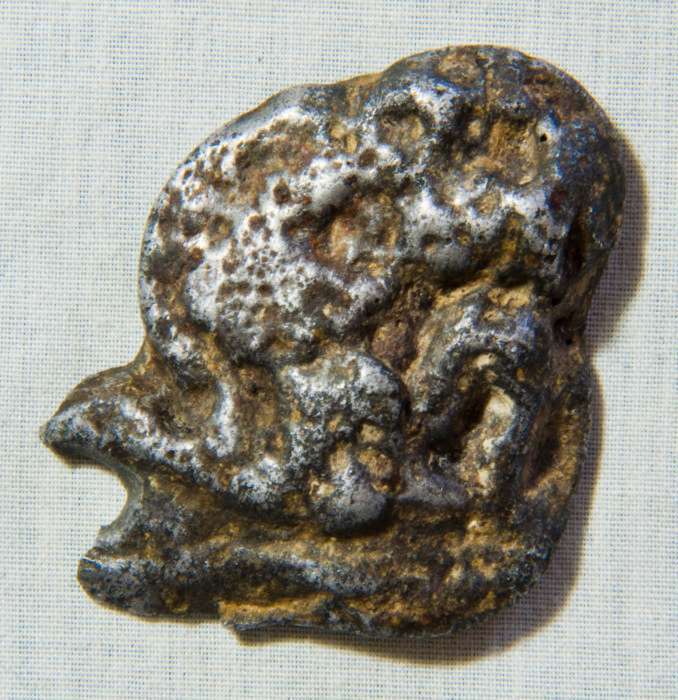 The above picture shows the aluminum artifact Glen Glover from South Arkansas found on his farmland about two feet (60 cm) down, in 2015. He sent his own report to me, which you can find below. The artifact looks like an amorphous piece. It is a little over seven inches long (18 cm). Analysis shows that it is composed of 95% aluminum. During the month of April 2015, I decided to purchase a metal detector. It’s a Garrett Ace 150 Model. I wanted to start a new hobby to share with my grand-daughter. I learn all the functions of operating the metal detector and decided to go out and explore are my yard. I reside in South Arkansas, mainly timber country, farming and oil. I live on property my grandfather purchased in 1940. He built his home here and start raising his family by farming and timber harvesting. I decided to raise my family in the same area, but on a plot of land that I remember as a kid picking pea’s and tomatoes from the farm land in the early 1970’s. To the best of my knowledge, I had an uncle who once lived near on this property as a farmer. He wasn’t the type to weld metal, just an old farmer type guy. He once told a story about something making a loud boom around his home in the mid 1970’s. We never knew much about science and meteorite’s growing up. Garrett metal detectors are said to identify different types of metal by a distinctive ping or magnetic response. I had learned to bench test different metals like the book explained to try first, like place a nickel on a wooden bench and moving the coil over the object to hear the sound it makes. Pennies are copper, so the sound is different than nickel or bottle tops. Iron metal has a special tone also, as well as precious metal. Of course, I was a skeptic. But sure, enough I was able to find lost coins in the soil around my home. The occasion penny, nickel, dime or quarter US mint coins. Trash objects are supposed to be discriminated out by the sound and magnetic responses. On this day in April, as I was within my yard, I got a strong ping on a metal object buried within the ground. It had the detector going across the board trying to identify the magnetic source, it said it was nickel, iron, coin, silver. Really a different reading. So, I dug deeper in to the farming type soil, which has been farmed since 1980, so it was well compacted. I finally struck something hard with my shovel. Maybe about 24inches down. When I got the object out, I was baffled to what it was made of, hence my detector was saying nickel. I cleared more soil off the object and saw that it looks like metal, but different. My next theory went to maybe it’s the thing my uncle had said he heard make the loud boom back when I was young. I started researching meteorites and thought I had discovered an amazing nickel/iron stony. It was light in weight but still a little unusual to look like metal. I grabbed a hand held magnifying glass and begin to study the object. I started noticing that when it was place in sunlight, it would sparkle, then display a rainbow of colors in reflective light. I tried a magnet on it. It was weakly magnetic. The outside had a burnt looking crust, but more melt looking lines. This object was weird looking to me. Also, there appeared to be orange crystal-like things in the outer metal. I took a hack saw blade and cut the back section of the object. To my surprise, it looks like cut metal. But when I broke a piece off, it looked like gray concrete rock with metal bits inside and a pearly interior substance. I decided to send a sample off to have someone tell me if it was meteoritic. I took several photos of the metal/rock object and decided to send a small sample to the New England Meteoritic Services, Mendon, Maryland USA. On November the 28, 2016, they sent me their result. I’m sorry, but all observations and testing were negative, the sample is not meteoritical. Its not a meteorite or of Martian or Lunar origin. I will include the letter in this report. They tested the sample with reflected light petrographic microscopy and chemically tested it for Ni. Their result was that it is a weathered rock fragment. The identified mineralogy is quartz, plagioclase feldspar and minor biotite. They said there were no meteoritic structures, clasts, or inclusions in the sample. They said it is terrestrial in formation. It is not a meteorite. I was kind of let down, but I learned a lot about meteorites. They even sent me a small meteorite for my interest and as a keep sake. It’s a stony iron. Well, now I knew from their report that I had a problem with my research. What is this strange looking metal/rock substance. I decided to stop my research and continue another project that I love doing, researching old towns and cemeteries. I was working on a project in a neighboring county, and glad to say my research dating back to 1845 lead to the long-forgotten town and cemetery being place on the National Historic register, Old Seminary the Under told Story. But eventually, I would grab the strange rock/metal and my curiosity would peak again about its origins and composition. I had earlier taken a sample to the local Oil and Gas museum to see the curator could identify it as a core sample from Oil production. This county boomed with oil discoveries in the 1920’s, so maybe they could help compare it to soil samples taken from deep drilling cores. They were also at a loss to describe it. Well, now I’m dumb struck. The curator at the Smackover, Arkansas Museum suggested I take it to the Arkansas Geological Survey in the State Capitol. I made the trip to Little Rock, Arkansas and to my surprised they were also at a loss for what it was. They asked me what part of the state I live and the exact location where I discovered it. Arkansas is known for bauxite, but where I live is not an area for bauxite ore. This part of the state was once a prehistoric sea. Next, I decided to find someone who may be experience in welded metals. A local welder told me he had never saw a piece of metal similar and that he didn’t think it was welding slag. I had the metal test at Southern Arkansas University, Natural Resource Research Center on 2/10/2017. Giga Geme, Ph. D, Associate Professor of Chemistry performed a Rock analysis by EDX, in a semi quantitative mode to identify elemental composition the 27.1-gram sample I sent. I am also including her results of this test. She identified the major element as aluminum, examining two areas. Al=95.612%, Fe=1.467%, S=1.089%, Cu=0.753%, Ta=0.311%, Zn=0.260%, Ca=0.174%, Ga=0.098%, Os=0.084%, Pb=0.079%, Ni=0.043%, Mn=0.032%. Area two results were Al=93.309%, Si=2.292%, Ca=1.109%, Fe=1.077%, Cu=0.0690%, Ta=0.0357%, Zn=0.270%, K=0.250%, Pb=0.102%, Ga=0.074%, Os=0.062%, Ni=0.036%, Mn=0.018%. Qualitative Result Element: Al, Rh, Mn, Fe, Ni, Cu, Ta, Zn, Os, Ga, Pb, W, S, Pd, Cd, Ca, Cr, Se. To me, that’s a lot of different elements in a rock. The complete rock weigh about 422 grams. I have been studying this strange rock for two years. So, in December 2017, I decided to allow the complete rock to be analyzed. I took the larger sample back to SAU Natural Resource Research Center about 35 miles away in Magnolia, Arkansas. Dr. Geme examined the larger rock/metal and sent me the results on 12/12/2017. Again, I was amazed by the results. The larger sample was tested in 6 different area sites by the EDX. I was really amazed at the other elements included such as Phosphorus, titanium, Silver. It was from the same rock/metal sample as the first sample that was analyzed in 2/17/2017. Recently this year, I read an article or TV show talking about the aluminum axe artifact. This has my curiosity growing and I hope this article can shed some light on what I found buried in my yard. I am quite sure if this aluminum artifact is ancient, or from a more recent, alien origin. One might expect that this is a metal slag from an aluminum processing plant, but there is none in the neighborhood. The metal composition is also strange. Aside from the aluminum it contains a large amount of other elements. Most of them are not found (in those quantities) in modern day aluminum alloys. Copper Silicon, Magnesium and Zinc are commonly used to give aluminum certain desired qualities. Additives like iron and phosphorus are rarely used. Iron, titanium, nickel are used for alloys that need to have a high melting point. Rare earth elements like Tantalum, Gallium and Osmium are normally not used in aluminum alloys. As you can see in the analysis below, all these elements and several more were found together in this artifact. I find it also significant that in an analysis of different point of a sample, the percentage of each element is different at each point. This would suggest that the aluminum artifact is not a homogeneous metal. If it was a slag of aluminum processing and refining, modern or ancient, it would indeed not be homogeneous, but it would also not contain so many. different elements. Bauxite, the primary ore for aluminum extraction, doesn't contain nickel or rare earth elements. Therefore, I speculate that it might have come from a technological device, containing many different elements, that exploded at high temperature, melting its different components, and blowing away bits of the molten material. This would explain that the composition is not homogeneous and why there are so many, different elements present in this piece. The form of the piece is also suggestive of rapidly cooling hot ejecta like we find with tektites. Tektites consist of terrestrial debris that is ejected during the formation of an impact crater when a meteorite hit the surface. During the extreme conditions created by a hyper-velocity meteorite impact, near-surface terrestrial sediments and rocks are melted and fly away throughout the air, and rapidly cooling. This process created particular aerodynamic shapes, mostly a round, a dumbbell or teardrop shape. It is just a wild speculation of mine, that the aluminum artifact might be from a technological device that exploded in midair. Considering the artifact has a well corroded surface, this might indicate that it is very old. Normally aluminum creates a very thin oxide layer that prevents further oxidation, although lying in wet soil might eventually create a much thicker oxidation layer the process. The following story should be mentioned, although there is only one rather short source. It appeared in several Russian articles as an addendum to a report of a crashed UFO near Dalnegorsk, Russia (1986) which was investigated by Valery Dvochynomo (Валерию Двужильному), who also investigated the Primorsky Gear at the beginning of this page. With the UFO crash they found some metal fragments they analyzed. 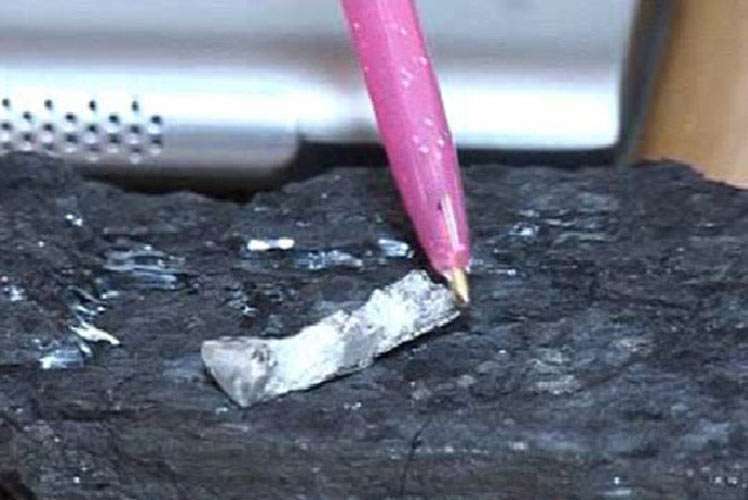 When he reported this UFO crash story he added another investigation to it, about some very unusual metal fragments found in an ancient geological layer. Cerium and Lanthanum are very rare metals. Chromium can be extracted from ores, but has a high melting point: ​(1907 °C, ​3465 °F). That of cerium is ​795 °C or ​1463 °F, and lanthanum 920 °C or ​1688 °F. "The second interesting finding by Valery Dvochynomo happened several years ago, when they started to build a bridge to the Russian island. Experts from Dalnegorsk of JSC "prospector" drilled wells on the seabed. They drilled the wells up to 10 meters and deeper into the Permian sandstones, which are 240 million years old. At a depth of 9 m core samples were brought to Dalnegorsk for analysis. Valery became interested in these samples. When the core was analyzed, he found an alloy of cerium and lanthanum-chromium, and other elements. They were in the sandstones in the form of chips, plates and pieces. And these pieces of metal, like sandstone must also have been 240 million years old. All this time they were "stored" inside the sandstones. These alloys were examined in various research institutes, including the Institute of Nuclear Physics in Gatchina. The scientists concluded that they are artificial alloys. 240 million years ago there were not even dinosaurs, and no humans." That also reminds me of the chrome steel ball found in a 17,000 year old statue, reported by Klaus Dona, a researcher in ancient artifact, who has gained a very good reputation in verifying the authenticity of artifacts that point to a highly advanced and technological civilization in the remote past. You can his lectures and interviews on YouTube (he shows many other very interesting ancient artifacts!). Here you have a kind of animal… it looks like a dinosaur. When Professor Pitoni found this statue, it was making a strange noise, so he opened the statue and they found inside a small black ball. You can see on the bottom of the statue [above right] and this was iron material. When we did the research on this artifact and especially on this metal ball, next morning the Professor called me and told me that somebody must have done a bad joke to me. Because the result of the research was this metal material is chrome steel and chrome steel was found first time at the beginning of the 20th century in Austria. That means it was impossible inside a statue with the age of approximately 17,000 years! But when I called immediately Professor Pitoni he was laughing and he said: I am a geologist. If a statue is making a strange sound, I do not open it just right away but I did several X-rays. 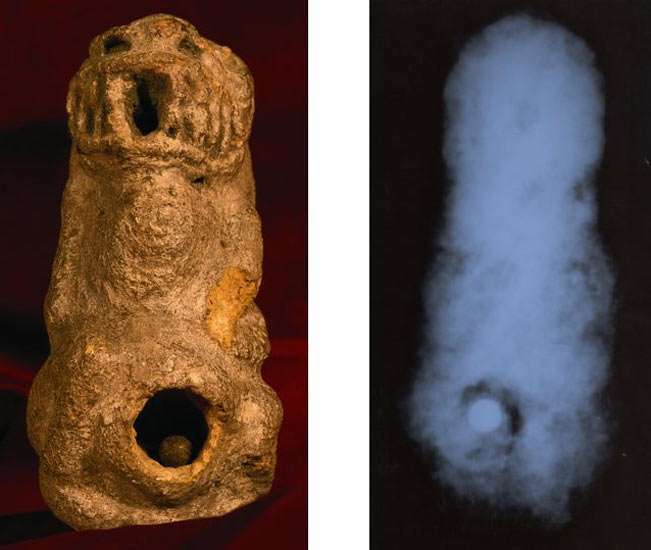 You can see here on the right picture [above] one of the X-ray photos and you see that inside the closed statue already the round ball, the chrome steel ball was existing. In this X-ray photo you can see exactly. And also Professor Pitoni saw that this stone statue, in former days, already was opened, but perfectly closed again. He called a specialist who opened it exactly concerning this photo, the small stone ball which was closing the hole inside, and you can see that the metal ball was already existing. Steven Strong from Forgotten Origin dug up a metal horse in Australia. It was buried one meter (3 feet) below the surface. This indicates that the artifact is thousands of years old. The unusual thing about it is that despite the often soggy condition of the soil in which it was found, the artifact does not show any sign of being corroded. Steven strong: "Until disturbance, this artefact sat one metre beneath the surface in soil that is often saturated for long periods. 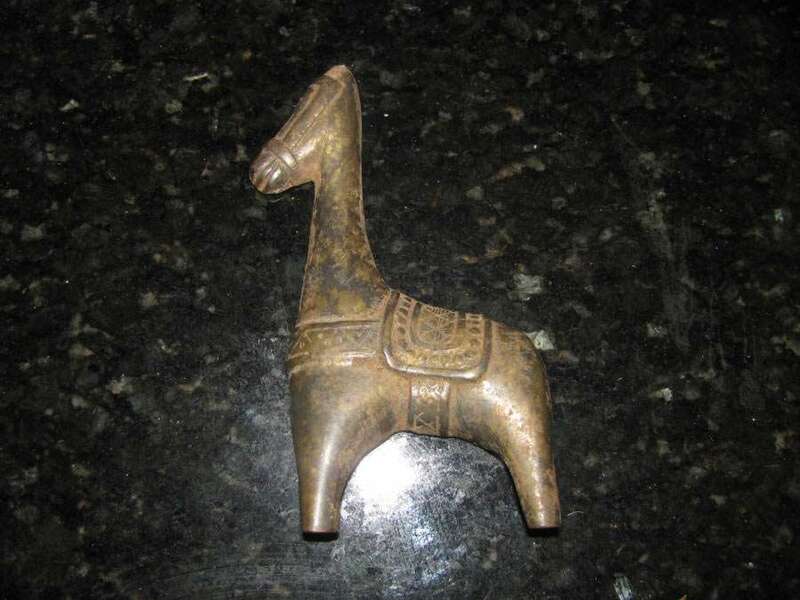 The outer metal case of the saddled animal shows no sign of any form of rust/corrosion and appears to be mainly copper. The inner side is obviously less protected and a slightly coarser coat, and on the neck there is a small blue tinge which could indicate a higher accumulation of copper in that area alone. The point of interest here is that the rest of the inner side shows no indication of oxidisation, it is as if one small area was not properly mixed during manufacture. We feel that because of this imperfection in production, the area bearing the highest concentration of copper has corroded first, while both inside and outside the rest of the surface may be worn, but has not lost its structural integrity." He showed it to several scientist who could not tell him what copper alloy it is made of. In a presentation given by Steven and Evan Strong at the UFO Research (NSW) Incorporated meeting held on the 16 April 2016 at Ryde Eastwood Leagues Club, NSW, Australia, he said that based on the visual appearance of the horse, the copper might also contain the metal molybdenum. He plans to have the horse analyzed for its metal components. Molybdenum is a rare earth metal that is now widely used to make metals, especially steel, very hard. It has a high melting point of 2610°C (4730°F). Molybdenum copper alloys have several advantages in the industry, such as high thermal conductivity, good machinability and special high-temperature performance. It also hardens the otherwise soft copper. In relation to the find of the horse, it is interesting to note that Molybdenum is corrosion resistant in air and water under normal circumstances. You can find more information about this find on his website by clicking the link above.